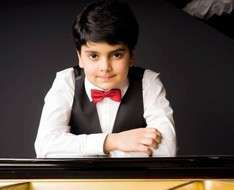 He was 11 years old when he represented Malta in the 2016 Eurovision Young Musicians Competition, and he will be turning 14 on February 15th this year. We’re talking about Russian-born Dmitry Ishkhanov who promises to enchant us with Mozart’s piano concerto no. 12, written when the composer was 32 years of age. Conductor/composer Michalis Economou (born 1973) however also had an early start on the music scene, having made his first public performance as a conductor at the age of 15 with one of his own works, while this concert sees him conducting another one of his works. Beethoven was 36 when he wrote the second work of the programme, his Symphony no. 4, which Schumann described as “a slender Greek maiden between two Norse giants” (Beethoven’s 3rd and 5th).